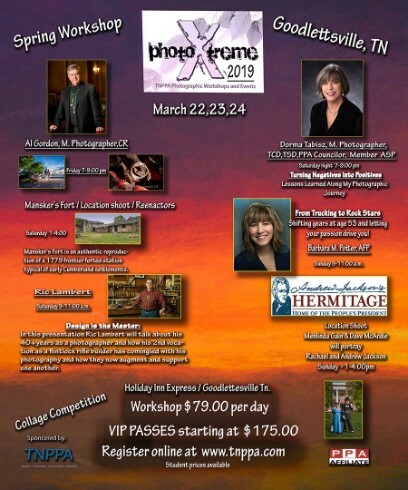 Tennessee PPA is hosting our Photo Extreme 2019 Spring Workshop Friday, Mar. 22-24. Get on the Road to Success and "Recharge"! Take advantage of $20 OFF of our regular price of $99, thru Feb. 28th! Non-members are invited to join us! The daily rate is $99/day, or you can APPLY online to become a Member for a limited time for only $225 and enjoy the workshop and get the Annual Convention for Free! Don't miss this huge savings! Don't delay, apply for membership today!